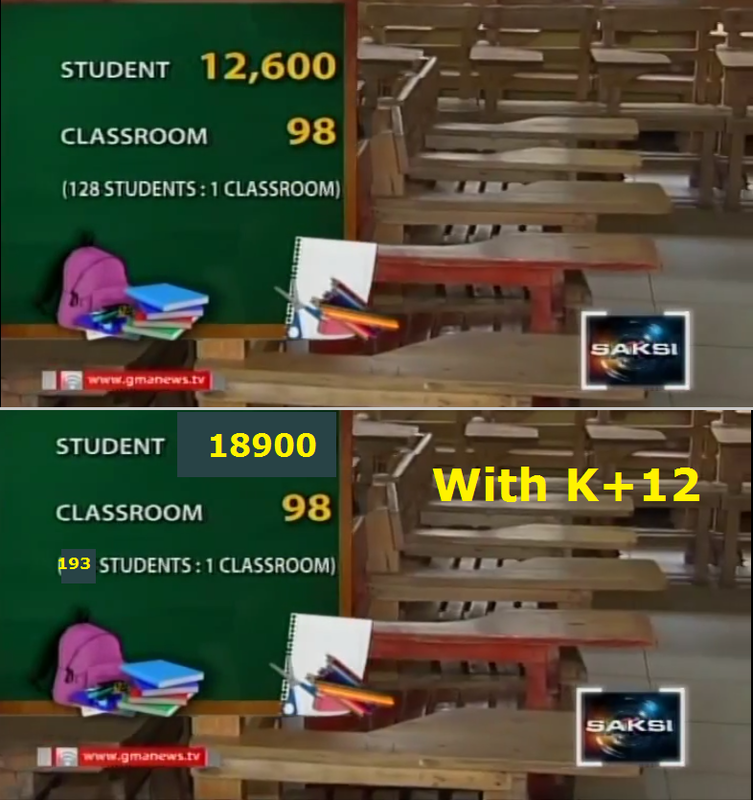 Troy Zarate de Leon captures a remarkable inconsistency between two news articles concerning Philippine basic education. On one hand, the Philippines has a president recently boasting to the international community that there are no more shortages in public school education. Here is the famous quote: "...Since taking office, our administration has cleared the accumulated backlog in classrooms, books, and chairs, which means that our students can go to school with the minimum expectation that they will have everything they need to succeed....". But reality on the ground is clear: There is at least one high school where there are more than 12,000 pupils assigned to less than 100 classrooms. The situation remains dire that the Department of Education is planning a 3-day school week to address the shortage in schools within Metro Manila. Things do look dismal in this particular high school in the Philippines. But it will be worse with the additional two years of K+12. 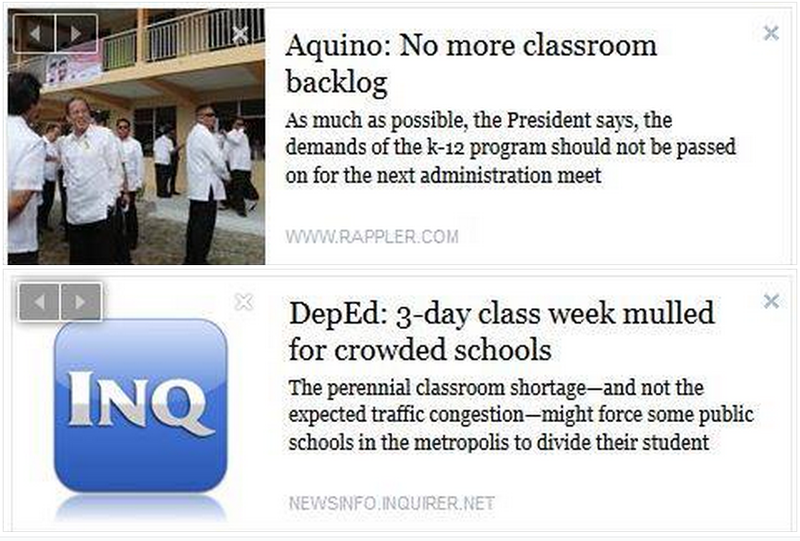 Unfortunately, reality on the ground does not matter to politicians and policy makers in Philippine education. DepEd apparently dropped the idea of holding three-day school weeks in congested schools citing that studies regarding this plan are still ongoing. If DepEd is beginning to consider a three-day school week to bring the ratio of pupils to classrooms down, with K+12, DepEd should perhaps start contemplating two-day school weeks. That will bring down the ratio to 64 pupils per classroom, which is still way above the capacity of these classrooms. A statement from the national vice chair of the Alliance of Concerned Teachers (ACT), Joselyn Martinez captures the predicament of the public school system in the Philippines: "These schemes will not solve the problem at all. What they need to do is simple and basic – add permanent items for teachers, construct additional classrooms and facilities and quit from making cheap gimmickry and rhetoric.” There are people who favor reforms such as K+12 because they sincerely believe that addressing the real problems of schools like shortages in resources is like "throwing good money after bad". This is a highly erroneous analogy. Public school education is all most people have. The public school system is not like a bad investment one could drop. It is not the same as someone buying a car and finding out that it needs an overhaul. In such a case, one can ask whether it is worth wasting additional money after wasting money once. For basic education, ignoring the real problems only leads to making the problems worse. 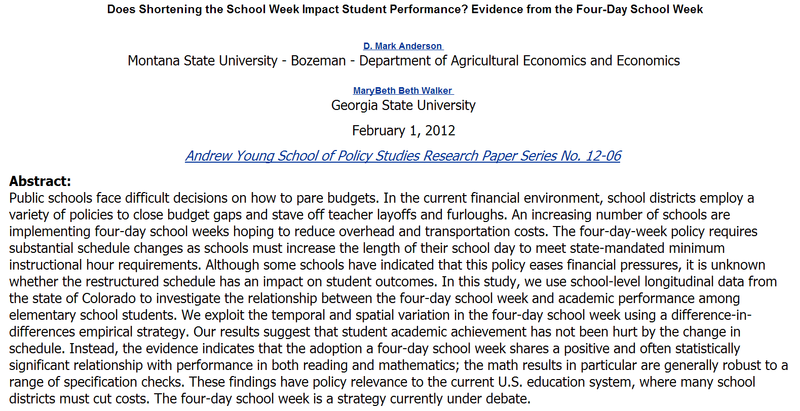 Does shortening the school week impact student performance? 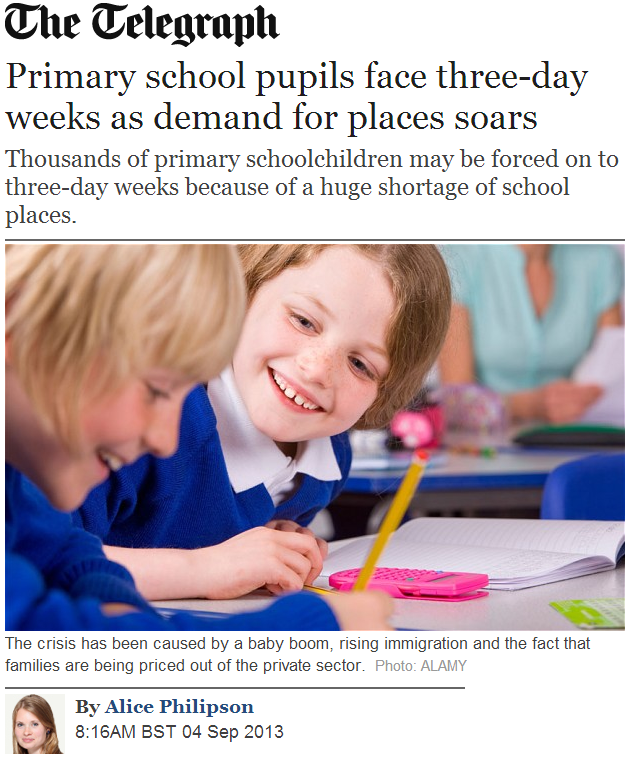 There are obvious reasons why there is paucity in research on four-day school weeks. Changing the schedule comes with changes in other factors. What schools do, what teachers do, what parents do, and what children do during the free day of the week, day five, can make a huge difference. 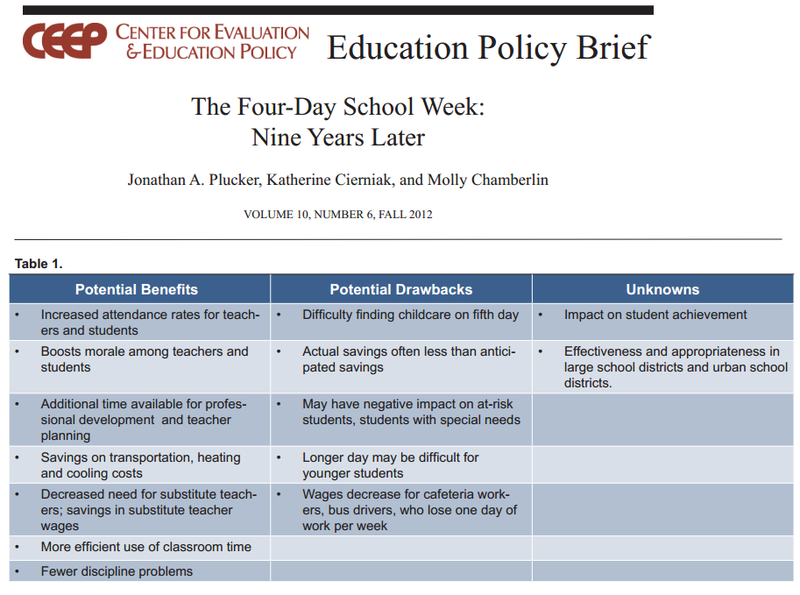 Measuring the impact of a three-day school week is also difficult and probably unethical. For instance, how can one study the effects of three-day school week in a school in the Philippines when these schools are already facing serious problems. When learning outcomes are already bad, instituting a bad policy may not seem obvious. It is like killing an already dead cat. There may be a reasonable debate for a four-day school week. Fairfax county has a four and a half day school week. The free half day is used by teachers to plan their lessons and meet with colleagues to discuss students. This may be a good reason for shortening instructional hours. 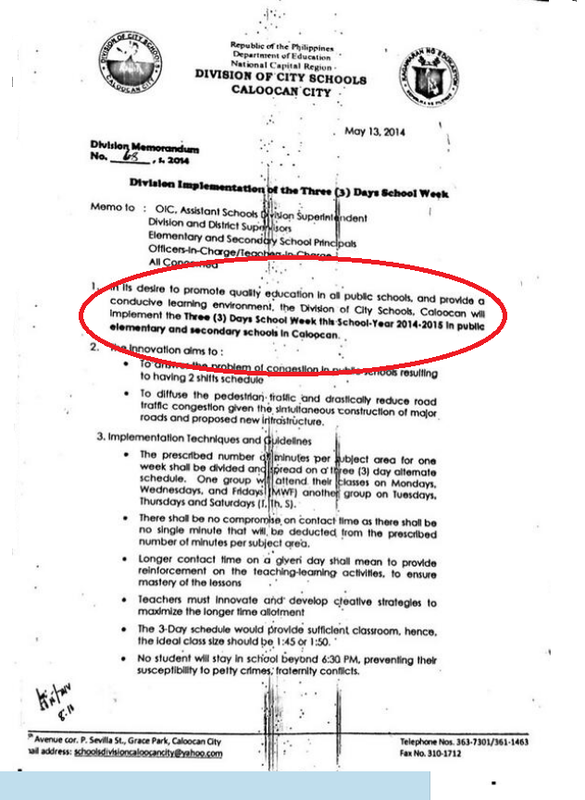 "In its desire to promote quality education in all public schools, and provide a conducive learning environment, the Division of City Schools, Caloocan will implement the Three (3) Days School Week this School Year 2014-2015 in public elementary and secondary schols in Caloocan." The nature of that vice chair means that School, Three-day school, Basic education and Public school education. In the occupation of vice chair, you can be a guiding light for individuals wanting to shelve School, Three-day school, Basic education and Public school education. for one of normalcy.